A new book by Michael King in the Insight Series. 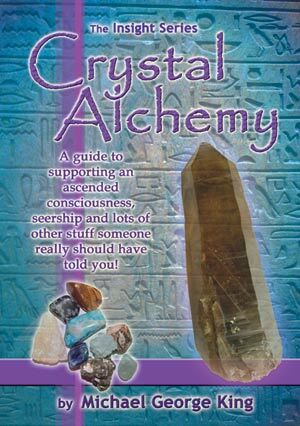 Crystal Alchemy is a simple guide to activating and supporting an ascended consciousness, actualising human potential and lots of other stuff someone really should have told you. Working with crystals assists us to attune to the energy system of the Earth so that we may sustain higher frequencies, which may aid us in the activation and actualisation of our both our DNA and soul blueprint’s fuller potential. Crystals are a precious kingdom of nature on this diverse and wondrous planet, and we can work together with them to create more harmony amongst all the kingdoms. Such is the basic understanding, the mindset if you will, which is necessary to begin your journey for exploring spiritual crystal alchemy. This book outlines the way Michael produced his own activation and attainment, it is a roadmap for you to follow to produce the same transformation for yourself! You can purchase and autographed copy from our store. Overseas customers are able to buy a copy from the following websites.